Over 8 hours of Natural Quiet! 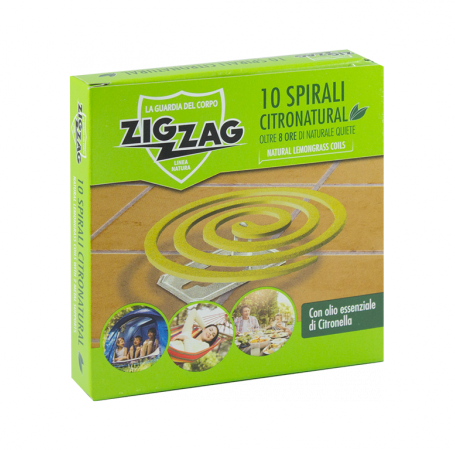 Citronatural Spirals for outdoor environments, gradually freeing essential citronella oil during combustion of the spiral, offer over 8 hours of natural quiet. Hold two fingers between the end of one of the spirals. Pull gently to separate the two spirals, BEING CAREFUL NOT TO BREAK THEM. Place the metal support and insert the tip into the center of the spiral. Each piece of broken spiral can be used by inserting it into the slit of the support. Turn on the end of the spiral. You will get a flame that will shortly go out on its own leaving a small brace that will emit a delicate thread of smoke.